Just started recording and not sure what to do next? This article includes how-to's for learning your way around in FullStory once you have sessions. Woo-hoo! Your FullStory recording snippet is successfully installed on your site, and you're ready to start using session replay to stay close to your customer's experience. See the big white box at the top of your screen in FullStory? That's OmniSearch. OmniSearch lets you easily search for sessions related to specific people or other key data points. To get started, click anywhere in the OmniSearch input box. FullStory will show a list of suggestions. Pause for a moment to take it all in. These are many of the available data points you can use to search across your sessions in FullStory (although there are plenty others you can discover by clicking the “More…” buttons). Next, start typing the word "clicked" in the OmniSearch input box. FullStory's suggestive search will narrow until it only shows you search criteria related to clicking. Typing into OmniSearch, as an alternative to clicking menu items, is a great navigational tool for the more keyboard-oriented among us. Now, click on the suggested "Clicked anything" prompt. The results are all of the recorded sessions where your customers or visitors have clicked on anything while navigating your site or web application. Nice work! You've got your first search under your belt. Get ready to save your first segment, or visit the Search Guide to learn more about OmniSearch. From your OmniSearch results, the next step is to save your first segment. Saving segments is helpful for any searches you use frequently because you can revisit them later without needing to rebuild your search. Click the "Save segment…" button and give your segment a name you'll remember, like, for example, People Who Clicked Things. Click "Save segment" to complete the segment creation. Bam! Now you've got your first custom segment in FullStory. 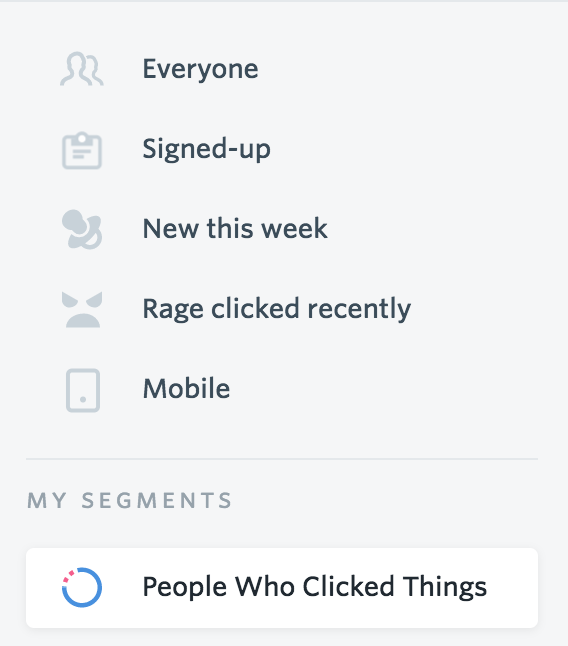 Your new segment will show up in the left-hand navigation under the "My segments" section. Any time that you build a segment that contains two or more event queries, FullStory will intelligently populate a Searchie with an Event Funnel report showing the conversion rate from one event to the next. In Omnisearch, just start typing for any engagement. For example, start typing for some text that a customer might click in a button or a link name. Select an engagement from the suggested results in Omnisearch. Then, go back up to Omnisearch and start typing again for some different text that a customer might click next after clicking the first link or button. Select that engagement from the suggested results. FullStory will stack those criteria together under Event Filters. Now, scroll down and look for the Event Funnel Searchie. The Event Funnel report will show you what percentage (%) of users took both actions. You can click "More" to expand the details. Remember: FullStory will build a funnel any time that two or more events (engagements) are included in a search or saved segment. With your basic FullStory housekeeping complete, it's a great time to dive in and watch some sessions. From any segment, view the sessions list and hit the play button for any sessions to start session replay. Need some big-picture ideas and inspiration about how to make the most out of session replay? Check out The Definitive Guide to Session Replay. Now that you have sessions recorded, you'll automatically start receiving a weekly FullStory Digest email with summary statistics for your recorded data. Out of the box, that email includes stats for common segments like Everyone, Mobile, New this week, Rage clicked recently, and Signed up. You can also include your favorite segments in your digest email. To see how this works, view your newly created custom segment and click "Add to digest" in the top-right corner of the results table. Now your custom segment has been added to your FullStory digest. Navigate to Settings > Notifications > FullStory Digest to see all of the segments included in your digest and to further customize the segments included in your email. Well done! Now that you know how to search, segment, and replay sessions, you've got all of the basic skills you need to wield the power of FullStory to answer questions about your customer experience. Don't stop now. Navigate forward to "Set your FullStory account up for success."